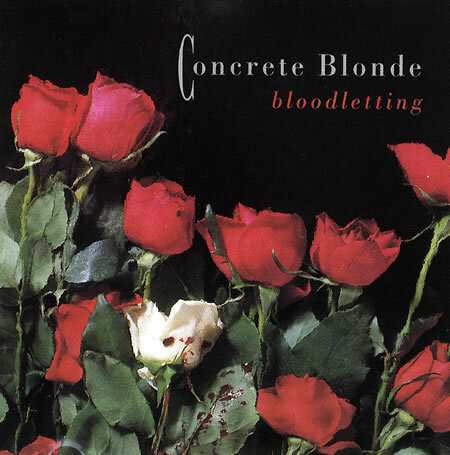 If you listened to rock radio at all last year, most likely you came across Concrete Blonde’s hit tune, “God Is a Bullet”, a fuel-injected tirade against the proliferation of guns, particularly in the drug- and gang-infested core of urban L.A. Over a thundering backbeat and squalling guitar harmonics, Johnette Napolitano’s vocals seethed, and you could tell she’d really had enough of mindless death and misery. A year later, she still feels strongly about the subject. “God Is a Bullet” created quite a controversy when it was released as the first single from the band’s second album, Free. Although it had been written two years before, it hit the airwaves just as the debate over the banning of semi-automatic weapons was in full swing. A lot of U.S. radio stations felt the tune was too intense for airplay; MTV wanted the band to remake its hard-hitting video for the tune. But Napolitano wasn’t too fazed by all the fuss. In the time between their last two albums, Concrete Blonde has gone through a major line-up change. First bassist Alan Bloch was let go, and Napolitano took back the bass spot she’d vacated after the band’s startling debut album of ’86. Then drummer Harry Rushakoff lost interest, and was replaced by Paul Thompson, whose previous work with Roxy Music had both Napolitano and guitarist James Mankey quite enamoured. Napolitano and Mankey have gone through a lot of ups and downs since they first met while working at a Los Angeles recording studio owned by Leon Russell. Their first album was a critical success, and sold reasonably well for a debut. But tough times were ahead for the band, which went bankrupt shortly after, due to an influx of “insta-bros”, with questionable motivations, in the guise of managers and accountants. Although they’ve been down about as low as a band can get in terms of the green, Napolitano and Mankey have somehow managed to make the world a little better place by scraping together whatever it cost to adopt foster children in Bangladesh, Chile, and Mexico. And just as the band’s luck has been turning for the better recently, so have the lives of the needy kids they’ve taken on. “When we played here [in London] on the 19th , and my sister sent my package of mail, there was a letter that said one of the kids—my favourite one, actually, the one in Mexico—didn’t need the money anymore because the father now knows a trade, and can work. We were putting him through school, basically.